At Astonishing Legends we have more than a passing fascination with the old west. In fact, our story folder is filled with potential future shows on some of our favorite topics, not the least of which is the enigmatic Billy the Kid. We're not convinced Pat Garrett killed him, but that's for a future episode. In the meanwhile, I was quite literally slack-jawed when Forrest forwarded me this story. There is ONE picture of the Billy the Kid out there in the world. Even the most unaware person knows that photo. See below. The next most amazing thing about this photo is they are playing croquet! Maybe that's not so amazing, but it's certainly not how we picture our favorite outlaws of the wild west is it? Link to Original Article with photos. It's not every day you can plop down two bucks and walk away with some "junk" that is worth a fortune. But that's what happened when a collector purchased an old-timey photo from a Fresno, Calif., antiques shop. It turns out, the infamous outlaw Billy the Kid is in the photo, apparently taking part in a leisurely game of croquet. The image could be worth up to $5 million. Kagin's Inc., a numismatics firm, announced it had authenticated the photo earlier this month. The 4-inch-by-5-inch tintype shows Billy the Kid in the summer of 1878. It may have been taken at a wedding, and he is alongside several members of his gang, The Regulators, according to the firm. In a statement, Kagin's senior numismatist, David McCarthy, said it took more than a year of careful inspection before the firm would confirm the photo's authenticity. "When we first saw the photograph, we were understandably skeptical — an original Billy the Kid photo is the Holy Grail of Western Americana. ... "We had to be certain that we could answer and verify where, when, how and why this photograph was taken. Simple resemblance is not enough in a case like this — a team of experts had to be assembled to address each and every detail in the photo to insure that nothing was out of place. "After more than a year of methodical study including my own inspection of the site, there is now overwhelming evidence of the image's authenticity." The only other known photo of the outlaw was taken in 1880 in Fort Sumner, N.M. That photo, a 2-inch-by-3-inch tintype, pulled in $2.3 million in 2010, according to Kagin's. 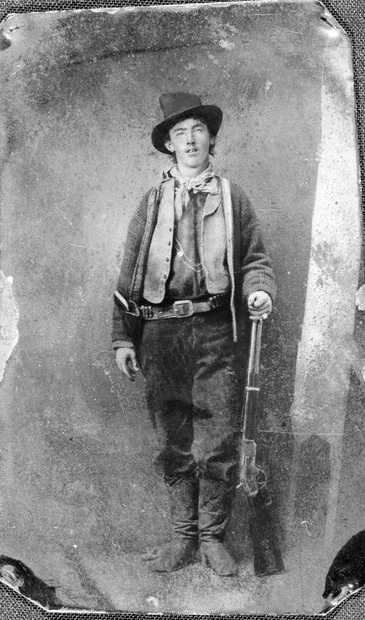 Billy the Kid, whose real name may have been Henry McCarty (he also used the alias William H. Bonney), has remained part of American frontier folklore for generations. He was a famous thief and gunfighter who was captured and sentenced to death but escaped prison after killing two guards. Legend has it that he killed 21 men, one for each year of his life. However, according to the New Mexico Tourism Department, the number was actually nine: four that he was solely responsible for, including the two guards, and five he helped dispatch. Billy the Kid was eventually tracked down and killed by Sheriff Pat Garrett at Fort Sumner in 1881. For more, see a video on this story here.